Our city is forcing us to get off steam. I have steam radiators and steam coil for hot water...any suggestions on best way to convert or to what. No duct work in the house. Why are they forcing you off steam? 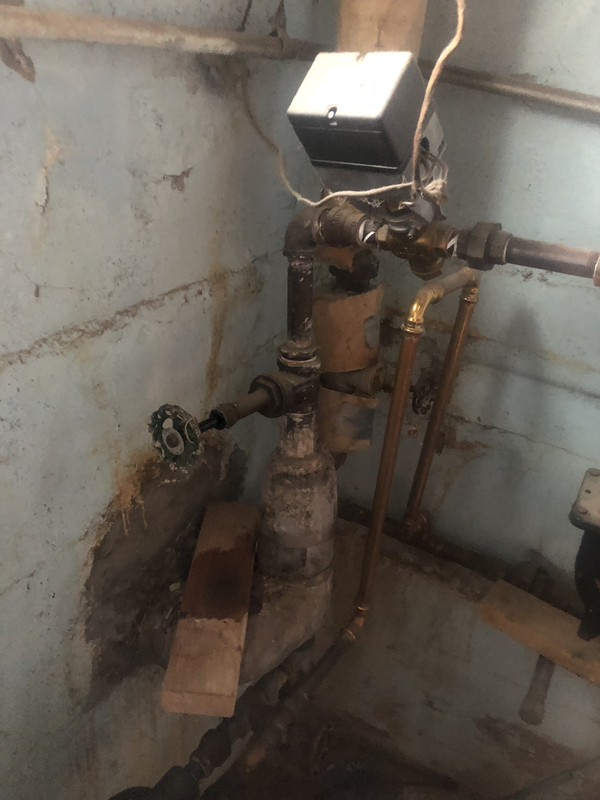 Point of carification, are they forcing you off district steam and now you need to install a boiler, or literally making you rip out your steam system? The second one I would have a hard time believing. So you need to have a steam boiler installed. If you post some pictures we may be able to advise you, not sure about the steam coil for hot water. Most likely need to install a stand alone water heater. 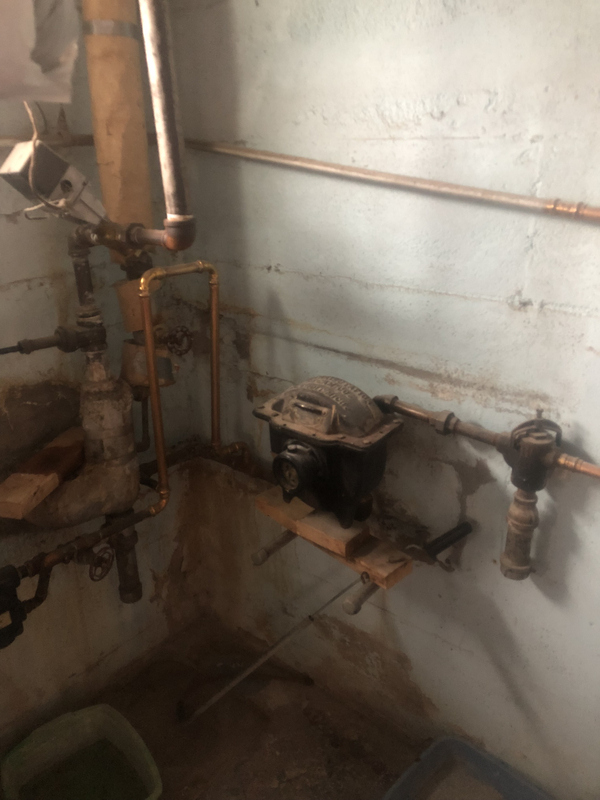 It won't really be that much of a hassle to install a good steam boiler in your house to take the place of the district system. You will, however, need to have it sized properly and piped right. This isn't rocket science, but it does seem to be beyond the capability of many "heating" contractors, unfortunately. 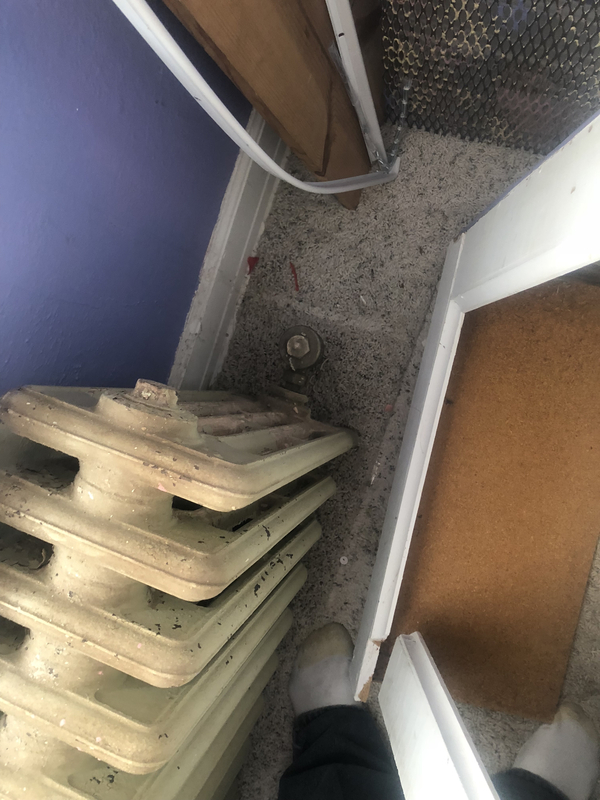 Can you go around your house and find out what size your radiators are? That's the first step, and determines the boiler size. We can help you with that. 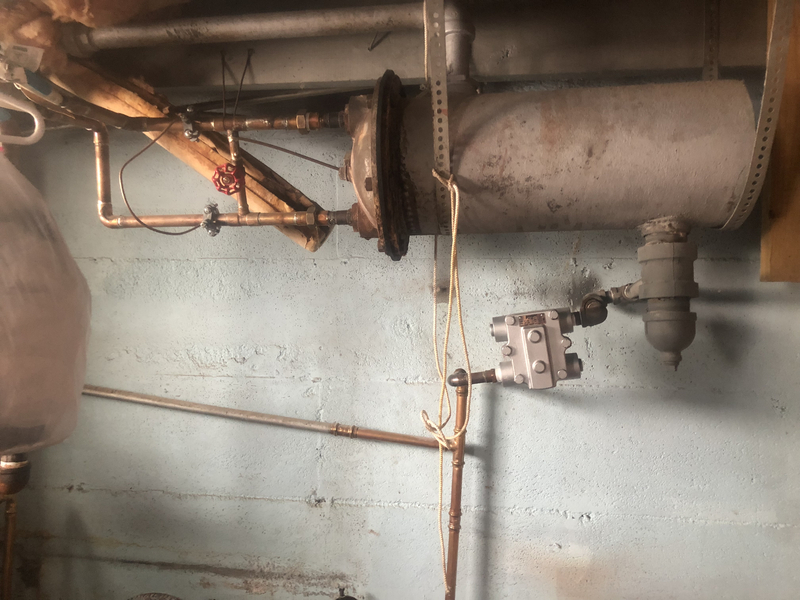 Then, take some photos of the existing connections to the district steam system. With those we can make some suggestions as to how to hook the header and returns of your new boiler in to the existing steam and return piping. Let me add that if you can get this to work right on your house, you'll be able to help your neighbours and others in the same situation -- and save them all a good bit of cash and trouble. Do you have any form of chimney going thru the roof? This also happened in Wilkes-Barre, PA some years ago. Getting a chimney is the challenge. Ok will do. I will get some pictures and sizes. We are being offered natural gas as an option. 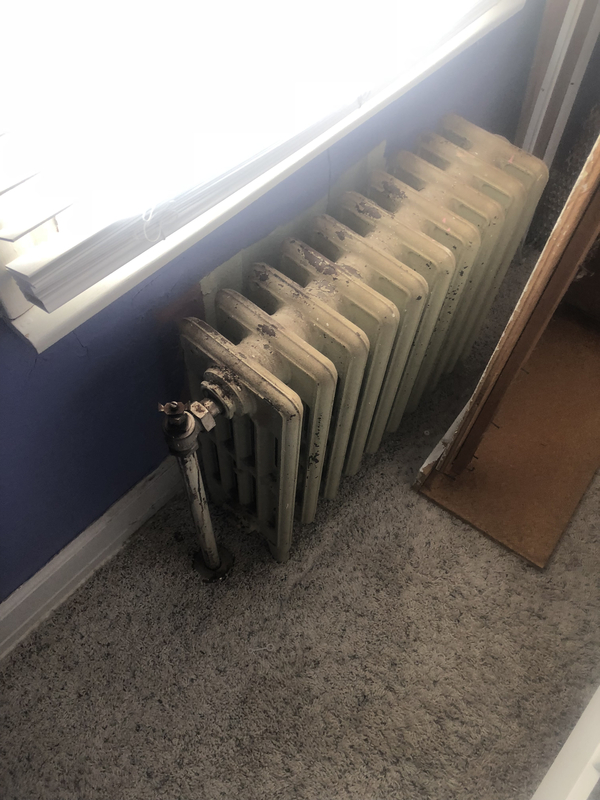 Looking for most efficient heating source...there is approximately 180” of radiator in length. 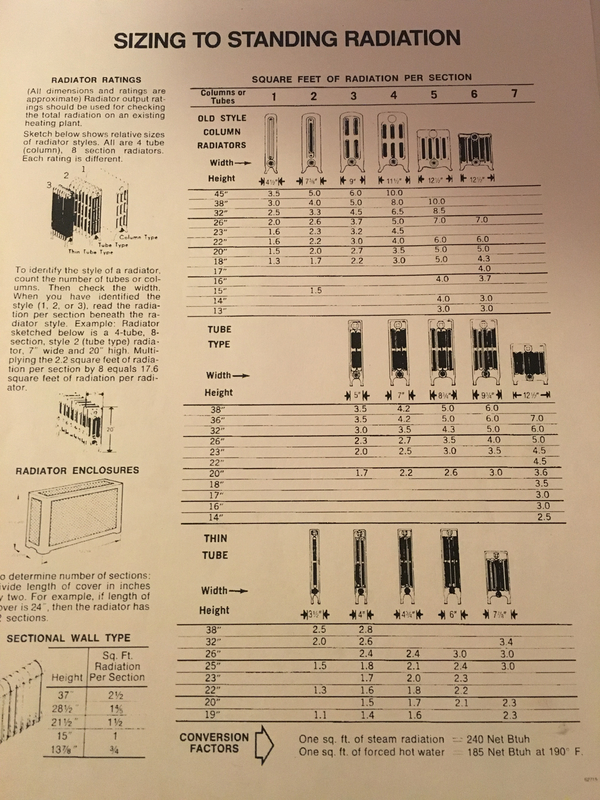 Do you need cubic size or just length? Not too worried about the hot water..will probably install a natural gas on demand. Or if you have other thoughts. It would be stand alone. That's not going to be a problem. Those radiators are very standard -- which is nice. Somewhere on this site there is a summary of "EDR" ratings. There's also a book -- "Every Darn Radiator" with the ratings. You find the same -- or very similar radiator, and it is a matter of length and height and number of tubes. Not a big deal. Add them all up, and that will be the total EDR of your house -- then what you need is to get a boiler the same size, or close to it. But a lot cheaper than ripping it all out and putting something else in! More satisfactory, too..
Any other suggestion? Steam boiler the way to go? Or do you convert to hot water boiler? Thanks for all the help. I will look up that book. Nice to be educated when the time comes. How open is your basement ceiling to your piping? My basement is all open right now...have been remodeling and just gutted it all....what you thinking? Story and a half. OK. If you have a chimney, that simplifies things. And I think you said you had gas? I'd go for a properly sized good boiler -- the Burnham @kcopp mentioned would be a very good choice, but there are a number of them -- and do it's near boiler piping correctly and then connect its header to your existing steam supply piping and its wet return to your existing condensate return. Done. Well, as I said earlier, there may be some other tidying up to do. That said, I don't suppose there are all that any steam boiler installers in Hibbing... however, with some help from us and an ability to read the instruction manuals which are helpfully provided with the boiler, a really good plumber can manage the job. But the very first job is to get the EDR ratings of those radiators. Isn't Hibbing Bob Dylan's hometown? Anyone know how a natural gas steam boiler with radiators compares in efficiency to a natural gas forced air furnace? Warm air is terrible, yes you can get 97% combustion efficiency but that’s only when the fire is on and it’s heating, otherwise once it turns off, the heating is done. Well... in theory, the natural gas forced air furnace itself can -- it it's properly adjusted -- achieve up to about 96% to maybe even a smidge higher. In the furnace. However, there are significant heat losses in the ductwork, even if it is well insulated, as well as a substantial pumping loss from the blower. How large are those losses, and how much do they drop the real world efficiency? I expect that somewhere out there there may be studies on that. My own feeling is that they probably drop the actual achieved efficiency to around 85%, give or take. As they say, your mileage may vary. A steam boiler has, of course, no pumping losses. A properly adjusted steam boiler should run around 83 to 86% efficiency. Which doesn't remove the fact that steam, with radiators, is much more comfortable than forced air, plus you already have the radiators and most of the piping -- so from a cost standpoint you'll be way ahead of the game to put in a steam boiler feeding what you have, rather than ripping the whole thing out and installing ductwork all over the place. Never mind the comfort standpoint. I suspect that you are probably right -- if the ducts are properly sealed and insulated, and if the steam lines are properly insulated. But then... there's always the argument about when is a loss a loss -- if the steam pipe or duct is in a space which needs to be heated anyway, is the heat loss a loss? 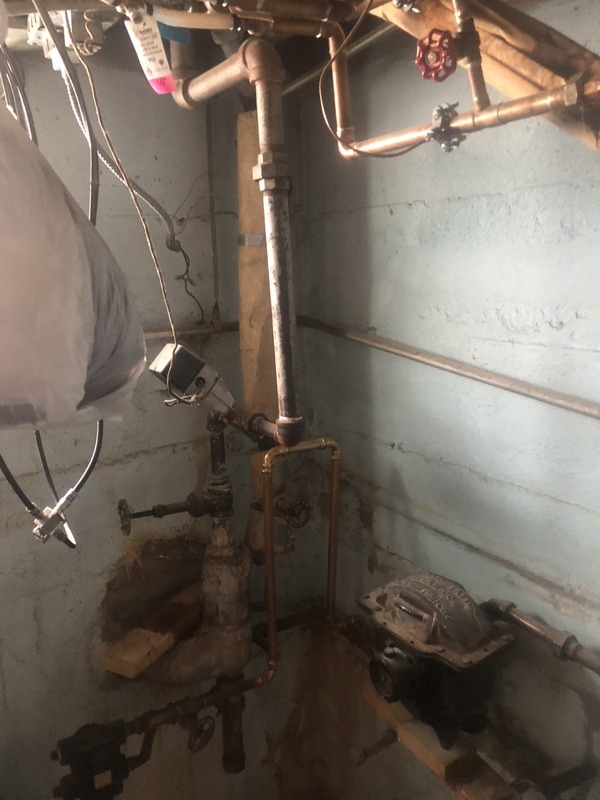 The argument for insulation on steam mains is much more to speed the movement of steam through the pipe on warmup, and avoiding excess condensation in what should be a dry pipe, than it is to avoid heat loss. Steam supply loses, unless in a crawl space, end up heating the basement and most of the heat rises and warms the flooring. You get some waste in mild weather, but really, you get most of it back. You end up with passive radiant floor heat. On 1 pipe steam, the risers to the 2nd floor are all in the conditioned space. Then you have radiant effect that allows you, depending on radiator placement to run a lower temperature and be comfortable. I've had many homes the last few years, most were hybrid dual fuel systems. Radiant is definitely more comfortable, hands down. Biggest challenge with steam is that it cycles because most all systems are oversized for various reasons. Forced air has the same issue. I bought a newer construction home with a 100k 80% furnace. Replaced it with a 40k BTU 96% 2 stage unit. Much, much more even heat. Kept up below design conditions no problem (-5F, design was 5F there). Less air leakage because static pressure is lower. Some ductwork was in semi conditioned crawlspace. > On 1 pipe steam, the risers to the 2nd floor are all in the conditioned space. Not mine. All 4 upstairs risers are in the exterior walls and they are freaking cold I’m afraid. > Biggest challenge with steam is that it cycles because most all systems are oversized for various reasons. > Forced air has the same issue. I bought a newer construction home with a 100k 80% furnace. Replaced it with a 40k BTU 96% 2 stage unit. Much, much more even heat. Kept up below design conditions no problem (-5F, design was 5F there).